1990’s Oak Kitchen Update – From Cringe to Cream! My clients were ready for a big change in their outdated kitchen. And while the cost of removing the bulkheads and the built-in light cloud were too high, we MORE than made up for it by creating a tone-on-tone palette which helped to blend-in the bulkheads and modernizes the space – without spending more money than we needed to! 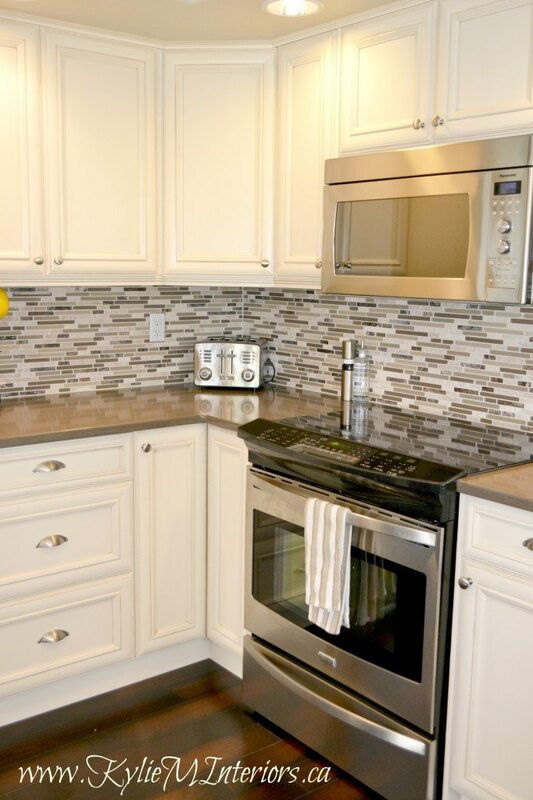 To save on the budget, we didn’t change the ‘footprint’ of the kitchen but gave it a brand new look with new painted wood cabinets, countertops and mosaic tile backsplash. For impact, we did a stainless steel and travertine blend mosaic backsplash tile from the countertop to the bottom of the cabinet. We pulled it all together with a gorgeous 2 tone quartz countertop that complemented the cream cabinets and dark wood floors. The layout might be exactly the same, but the LOOK is totally different! 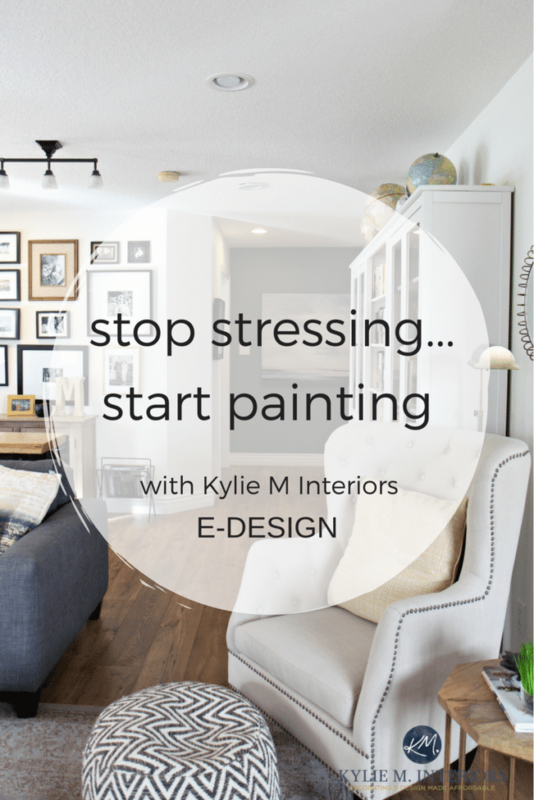 Check out my affordable Online Decorating and Colour Consultations for your own custom-tailored design! Hi Kylie….just came across your website….very nicely done. Was looking at the kitchen you did in Eaglepoint….my kitchen is very similar to this one with the bulkhead and cupboards. Last year I painted our cabinets (which were previously oak) with BM paint (2 coats)….I was pleased with the colour (Ranchwood) but now I have chipping and wearing around the door knobs that are used the most. This is not a high traffic kitchen….just the 2 of us. 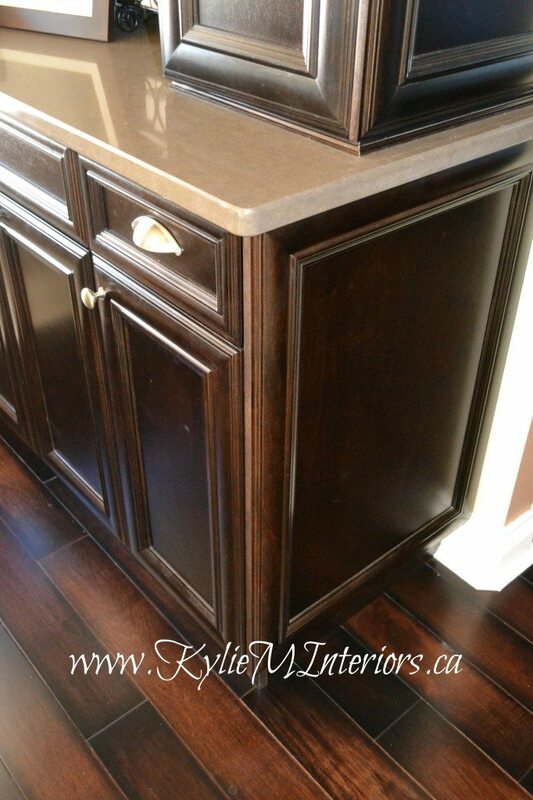 So my question is…..which BM paint is the most durable for kitchen cabinets and should I put a top sealer on. Hi Jane, thanks for writing! 2. Those areas (and also the ones above the stove) tend to get build up of oils and what not from hands/cooking, sometimes you have to prime it to ensure good adhesion. Some people also use TSP prior to sanding as it really cuts through the grease, I’m just not a TSP fan myself. 4. As long as you do good prep work and use a quality paint on top then you should not have a problem with chipping and you definitely won’t need to do a topcoat. If the foundation isn’t solid, a topcoat of poly or varnish will not help. As for now, if you’re thinking of redoing the entire cupboards then you could definitely switch to Advance. However, if you’re just hoping to ‘touch things up a bit’, then be sure to use your old paint brand so that finishes are as close to compatible as possible. It’s going to be tricky as no touch-up is seamless, but oak cupboards have so much grain that they are more forgiving than a lot of other woods. Try sanding those spots down, kind of feather it out, then apply a rolled coat of primer (Ben Moore Fresh Start is a good one) and then paint those spots. Let me know if that helps, that must be really frustrating as painting the cupboards is a heck of a lot of work!!! Thanks Kylie for your fast reply…..after reading your post….I know what I did wrong. I had wiped the cabinets with TSP and lightly sanded, BUT….I just painted 2 coats of BM….I didn’t prime…..shame on me!!!! So I guess I will lightly sand again and then prime before applying 2 coats of the paint…..right???? Just finished, this Spring, painting the main floor in BM “grey mist” so I want to paint the cabinets an ivory or some variation of white or I might continue the “grey mist” onto the cabinets to make a seamless transition with cabinets and walls as I do have a bulkhead….Good thing I like to paint…lol. Many thanks for taking the time to answer my problem! 1. Good old Cloud White – acts like white, just not so harsh! 2. Dune White – just the lighter version of Gray Mist, meaning it will still blend really nicely with the walls and the bulkhead without being the same colour. Fantastic kitchen!!! We are in the process of remodeling our kitchen and I love the countertops you used here! Would you be willing to share the brand and color? I’m glad you’re inspired! I’m SOOOOO glad we did it (we did the same thing in the bathroom, but went gray instead). I say GO FOR IT! I am curious how you changed the cabinet doors. Are they new or did you somehow fill the old carvings and add new molding to make them look different? Hi Sommer, they are new cabinet doors!